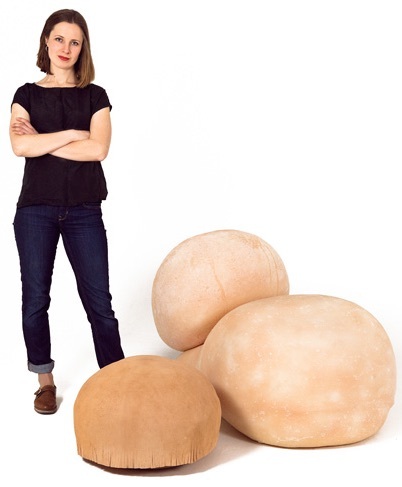 Gigi Barker is a London-based designer; she has created a skin chair, which is designed to feel just like sitting on a fat guy. Gigi Barker, a London-based designer, has designed a leather chair with a pheromone-impregnated silicone base that makes it feel (and smell!) like you’re lounging in the fleshy, comforting folds of a man’s belly. Barker spent two years perfecting the disturbingly realistic texture and color, which is pink and lightly mottled. The scent comes from the aftershave of the anonymous man whose form the chair is modeled on. I myself had a similar experience while shopping for a leather couch in the summer. I was wearing a pair of shorts and a t-shirt. I found a chair that was designed to look exactly like a hand, a four-foot tall hand. I was completely freaked out by the smooth leather, which was remarkably like soft flesh. Anyway, this skin chair seems to me to be an attempt to realize some aspect of the chair dog from Frank Herbert's 1964 novel The Tactful Saboteur. He indicated a chairdog against the wall to his right, snapped his fingers. The semi-sentient artifact glided to a position behind McKie. "Please be seated." Chairdogs could also gently massage people, which is a feature that Gigi Barker could add to the Skin Chair.